Today we made great progres in the Wilderness Trail area. We concentrated on the more difficult elements first, starting with the 'woodwork' around the waterfall and pond and then working our way westward. We also finished off the beams that will hold the climbing bridge up to the treehouse. With each piece the park was transformed yet again. Liz, Chris' wife came by to take a look at the park progress and we immediately pressed her into service as our guest carver. Liz sculpted one of the support posts that will hold the barrel bridge. Even though it was her first attempt at this kind of thing, she did a great job! Delightful spaces in theme parks don't often happen merely by chance. Every detail is purposefully designed and positioned. It is important that each element works together, starting with a close view, a middle view and a long shot. 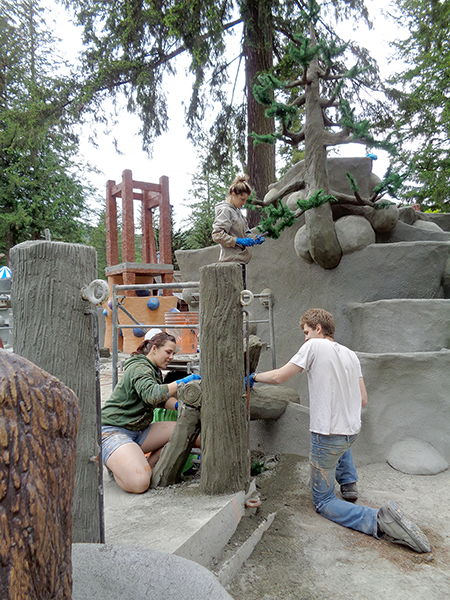 As we mudded and carved the last pieces in this area the planning we had done became evident. Our guests won't notice the forethought but they will see the effect subconciously. In the foreground the barrel bridge (not yet built) will 'float' on the water. Behind is the lookout and a waterfall and the shallow rock pond with the water tumbling into the larger pond. (mid-view). The short view and mid view are framed by the background dirtbanks, the treehouse and by the cable bridge that will soon be susoended between the posts. Because we design real worlds where guests can freely move we have to not only thnk of viewing features from one direction. The closeup, middle and long views have to work from every angle. Here's a shot of the same area from the opposite angle. And here's yet another angle photograph of the same area. We take that same design approach all through the park, purposely delivering to our guests something that will visually appeal close, midview and long distant - no matter where they stand. Each and every possible view from any angle is carefuly designed to be pleasing to our guests and to draw them into the world we have created. Some areas of the park still need a great deal of work. As we place each feature we are thinking ahead of what will be in proximity, close behnd and in the distance. We think about guest interaction and how traffic will flow through. Photo opportunities are not randomly placed but instead carefully planned. It is all in the hope of creating an immersive and pleasing environment for the guests. 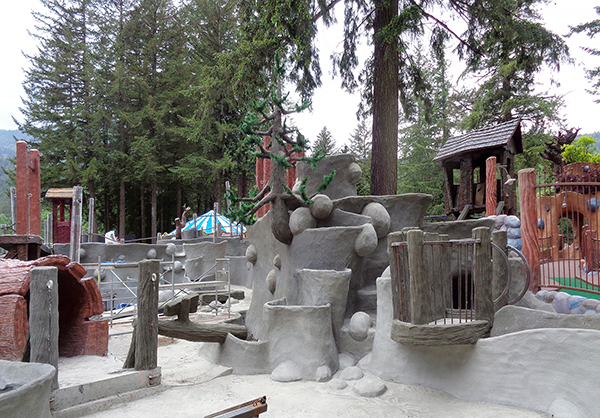 It is very satisfying to watch the park come alive as we rapidly work to completion. Stay tuned for more as we finish.